Ded Moroz, or Grandfather Frost, lives more than 600 miles [1000 kilometers] northeast of Moscow, among pine forests on a cliff above the Sukhona River. Twelve years ago, Moscow’s recently replaced mayor, Yuri Luzhkov, declared the small, but idyllic woodland town of Veliky Ustyug the official home of Russia’s Santa Claus. More recently, it has become a vital source of commerce and tourism for the region. The estate attracted 3000 tourists the year it opened. Now there are more than 200,000 visitors annually, and the estate employs almost every adult living in Veliky Ustyug. The recent closure of a local bio fuels factory has made this alternative source of employment even more urgent. The local authorities have attempted to harness the history of what was a monastic and then a merchant town to lend depth to Ded Moroz’s relatively recent arrival. “We might be small, but we are great indeed,” said the head of Veliky Ustyug’s regional administration, Nikolai Ilyushin, referring proudly to the epithet “Veliky,” meaning “great,” which the town acquired sometime in the 15th century. The Ded Moroz estate itself, known as the “Votchina,” is outside the town in a scenic pinewood. The centerpiece is the wooden Terem, the mansion where Ded Moroz is said to live. The satin covered bed, with its carved headrest and fluffy slippers, is not hugely convincing, but Ded Moroz himself, nearly seven feet tall with a booming voice and bone-crushing handshake, is quite an overwhelming presence. To help preserve the mystique, the true identity of the huge actor who plays Ded Moroz is a closely guarded trade secret. The Russian Ded Moroz has a more ancient sensibility than the commercially branded western Santa. While his coat is often red and he sports the same long white beard, he is more stern than jolly and his robes are embroidered and vary with the seasons, since this is a year-round attraction. Indeed, Ded Moroz has a wardrobe worthy of Ken from “Toy Story 3,” including midnight velvet, spangled silver, pale blue silk for the summer, Vologda linen and felt boots called Valenki. One recent addition to the wardrobe is a red and white tracksuit with a “Russia” logo, in which Ded Moroz leads groups of costumed children in aerobics classes. This is part of a bid to make Ded Moroz the mascot of the 2014 Winter Olympics in Sochi. Fourteen-year old Danil Rastorguyev, a member of the young Ded Moroz Press Service team, explains very seriously that there is a children’s competition to choose the official talisman. The competition, run through the site talisman.sochi2014.ru, has collected more around 12,000 children’s drawings and closed on December 5th. Other attractions of Santa’s woodland home include the “path of fairy tales,” an outdoor obstacle course where tourists can meet a number of characters from Russian folklore. Some of these are quite well known, like the witch Baba Yaga, played by a man in drag, but Baba Yaga’s good counterpart “Zhar Baba” (“Granny warmth”) seems to have been largely invented as an excuse for visitors to sit by the fire in a log house hung with dried flowers and drink herb tea from the samovar. Ded Moroz’s workshop is upstairs, next to the throne room. Children and adults can make their own souvenirs here. These include birch bark ornaments, delicately imprinted with patterns, traditional rag dolls and lace. Lace making is one of the regional specialties. Santa’s Post Office, next door to the town house, is one of the most active parts of the whole operation. The post office has received nearly two million letters since 2003. Lyudmila Suranova, one of the post office’s eleven full-time workers, explained that in the peak season they employ forty extra staff members to help with the onslaught of mail. Some of the letters come from children who are having problems, often at school. Suranova said that the post office tries to help where it can. The local lakes and rivers freeze around mid-November and this is when the festivals begin, including Ded Moroz’s official birthday. Between the birthday festival and the New Year festival, Ded Moroz takes off on a tour of duty around Russia, which culminates in his lighting Moscow’s main Christmas tree. 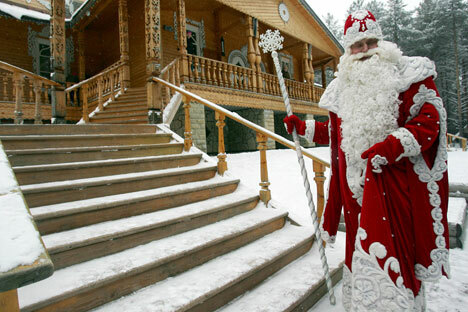 Moscow has its own, much smaller, Ded Moroz estate, where he visits. But there is something about Veliky Ustyug that has managed to capture the ancient spirit of Christmas, albeit infused with a large dose of modern-day kitsch.